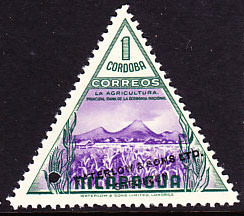 9008 SPE NICARAGUA (1947) Agriculture. Overprinted SPECIMEN and printed in different color than issued stamp. Scott No 716, Yvert No 734. 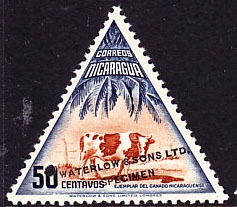 9095 SPE NICARAGUA (1947) Steer. 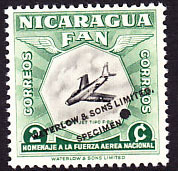 Overprinted SPECIMEN and printed in different color than issued stamp. Scott No 715, Yvert No 733. 9457 SPE NICARAGUA (1947) Ruben Dario monument. Overprinted SPECIMEN and printed in different color than issued stamp. Scott No C287. Dario was the founder of the "modernismo" movement in Latin-American literature. 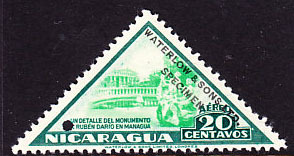 9458 SPE NICARAGUA (1947) Ruben Dario monument. Overprinted SPECIMEN and printed in different color than issued stamp. Scott No CO39. Dario was the founder of the "modernismo" movement in Latin-American literature. 9459 SPE NICARAGUA (1947) Ruben Dario monument. 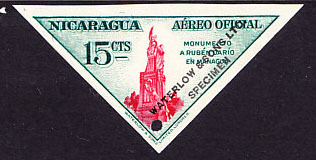 Imperforate overprinted SPECIMEN and printed in different color than issued stamp. Scott No CO39. Dario was the founder of the "modernismo" movement in Latin-American literature. 10612 SPE NICARAGUA (1947) Tipitapa spa. Overprinted SPECIMEN and printed in different color than issued stamp. Scott No CO42. 11839 SPE NICARAGUA (1947) Sulphurous lake of Nejapa. Overprinted SPECIMEN and printed in different color than issued stamp. Scott No C288. 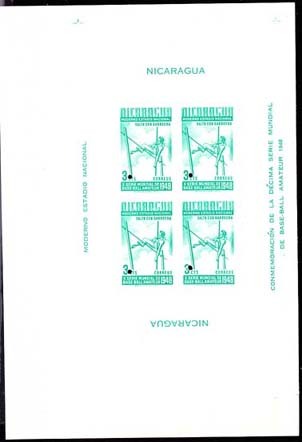 2408 SPE NICARAGUA (1949a) Baseball diamond*. Female softball player*. 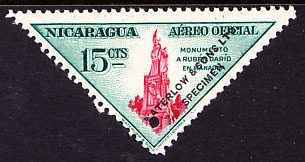 Specimen in color different from issued stamp. 10th World Series of Amateur Baseball. Control punch and overprint of Waterlow & Sons. Scott No 717, Yvert No 735. 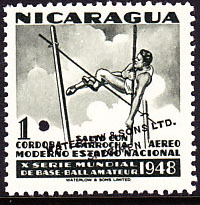 11295 SPE NICARAGUA (1949) Pole vault. 1 centavos. Scott No 717. Yvert No 735. One of a set of 26 values issued to publicize the tenth World Series of Amateur Baseball. Each denomination was also issued in a souvenir sheet containing four stamps and marginal inscriptions. This item is the Proof Specimen Imperf. Souvenir Sheet from the Waterlow Archives. 190mm x 132mm. As usual each stamp from the Souvenir Sheet is punched with a 2mm hole. Only 4 copies are known, 3 being in private collections. Like the other 3 existing copies, this item has some small faults: mostly creases, but overall this never hinged copy is magnificent and a unique opportunity to add this rarity to an advanced collection or exhibit. 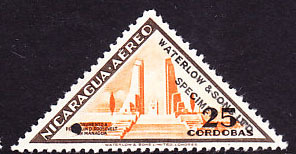 11297 SPE NICARAGUA (1949) Pole vault. Overprinted SPECIMEN and printed in different color than issued stamp. Scott No 719, Yvert No 737. 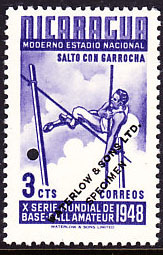 11304 SPE NICARAGUA (1949) Pole vault. 1 cordoba. Scott No C306. Yvert No PA277. One of a set of 26 values issued to publicize the tenth World Series of Amateur Baseball. Each denomination was also issued in a souvenir sheet containing four stamps and marginal inscriptions. This item is the Proof Specimen Imperf. Souvenir Sheet from the Waterlow Archives. 190mm x 132mm. As usual each stamp from the Souvenir Sheet is punched with a 2mm hole. Only 4 copies are known, 3 being in private collections. Like the other 3 existing copies, this item has some small faults: mostly creases, but overall this never hinged copy is magnificent and a unique opportunity to add this rarity to an advanced collection or exhibit. 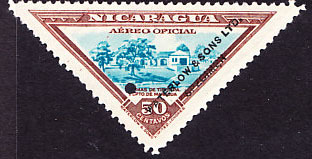 11305 SPE NICARAGUA (1949) Pole vault. Overprinted SPECIMEN and printed in different color than issued stamp. Scott No C306, Yvert No PA277. 11344 SPE NICARAGUA (1949) Stadium. Postal tax issue for 10th World Amateur Baseball Championship overprinted SPECIMEN in different color than issued stamp. Scott No RA60. 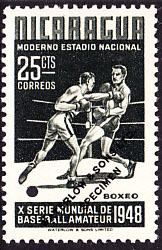 11353 SPE NICARAGUA (1949) Boxing. Overprinted SPECIMEN and printed in different color than issued stamp. Scott No 724, Yvert No 742. 9516 SPE NICARAGUA (1954) Sabre jet. Overprinted SPECIMEN and printed in different color than issued stamp. Scott No 786. 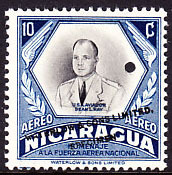 9518 SPE NICARAGUA (1954) Captain Dean L. Ray, USAF. Overprinted SPECIMEN and printed in different color than issued stamp. Scott No C346. 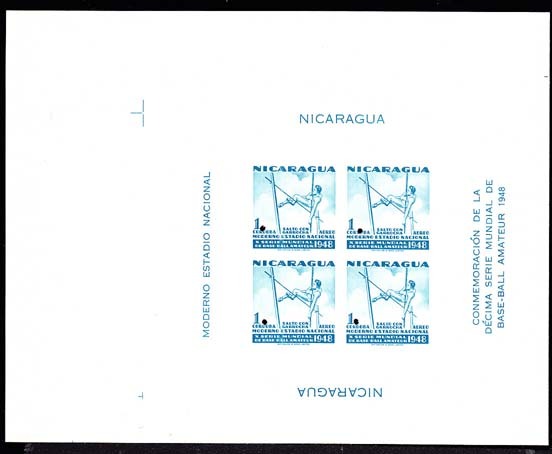 11763 SPE NICARAGUA (1954) Symbols of the UN. Set of 7 overprinted SPECIMEN and printed in different color than issued stamp. Scott Nos C339-45. 918 SPE NICARAGUA (1974) Churchill*. Speech*. Specimen overprint. Scott No 918, Yvert No 948.